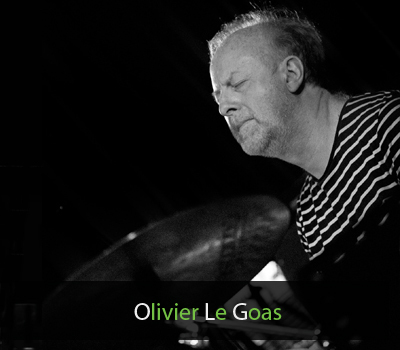 In 2006 “GRAVITATIONS” Olivier Le Goas Quartet with John Abercrombie (Altrisuoni / Anti – Craft) “An original and pleasant disc” Jazzmag / “In fact Le Goas has a flair for rhythmic demolition »Jazz’n More. Reciprocity the recording at hand, is also a quartet effort, featuring the marvelous high profile pianist Kevin Hays, joined bassist Phil Donkin and guitarist Nir Felder, along with the leader behind the drum kit. The piano/guitar front line weaves a tight rhythm. There are clean unison lines and an inspired trading of solos. Guitarist Felder crafts a resonant, full-bodied sound; pianist Hays has a looser approach, and the collective effect is a modern jazz/precision chamber/ groove-centric music, reminiscent of—with its own distinctive personality—the Pat Metheny Unity Group, minus the electronics and synths and the orchestrion. In spite of the chamber approach, Le Goas has a distinctive, full-of-surprises, off-kilter drumming style, one that enhances and punctuates with exclamation points the lubricious flow of this unfailingly engaging music.